Andrew Kaiser and Jennie Holbrook were married on 22 July 1885. Both of them had been married previously, and had had children with their previous spouses. Andrew had eleven children with his previous wife, Elizabeth Wentsel. Four of these children died young, before Elizabeth’s death in 1884. Jennie had previously married Thomas Burke, and they had three children. She was granted a divorce from him in June of 1885. Although it’s not clear how Jennie and Andrew met, they lived in the same small town of Prophetstown in Whiteside County, Illinois. Thomas Burke was a druggist in town, and Andrew Kaiser was a tinner. Both businessmen may have known each other, and may have been in the same social circles. After losing their first spouses, both Andrew and Jennie found themselves as single parents, with at least several small children at home. Joining their households was likely a beneficial situation for them both. After Andrew and Jennie married, they had four children of their own. The family lived in Prophetstown until about 1891, when they moved to the city of DeKalb in DeKalb County, Illinois. My great-grandfather, Glenn Kaiser, was born there in 1893. Their youngest child, Floyd Arthur Kaiser, was born on August 29, 1900. When he was born, Floyd was the youngest of thirteen living children. His oldest living half-brother, William Andrew Keiser, was 33 years old. Floyd lived in DeKalb for his whole life. Floyd grew up in DeKalb, and attended the public schools in the city. He was 17 when the United States entered World War I. His two closest older brothers, Alfred and Glenn, were both in the Army during the war. (See a photo of Glenn in the Army here.) Floyd stayed at home to finish school and help his father with his tinning business. Floyd’s father, Andrew, was a tinner. (A tinner, or a tinsmith, would work with sheet metal in his shop.) He appears to have taken his tinning business from Prophetstown to DeKalb when they moved. He owned and ran his own tinning business in DeKalb on Pleasant Street until his death in 1923. His two youngest children, Glenn and Floyd, were very involved in the tinning business when they were teens. They took over the daily running of their father’s business in about 1920 when their father’s health started to fail. They continued as business partners on their own after their father’s death. The Kaiser Brothers Company was located at 624 Girard St. in DeKalb. It appears that their sheet metal business did a lot of work with furnaces, stove pipes, and other heaters. Glenn decided to give up the business shortly after his brother died, and Nestor Lawson took over the business in September 1935. 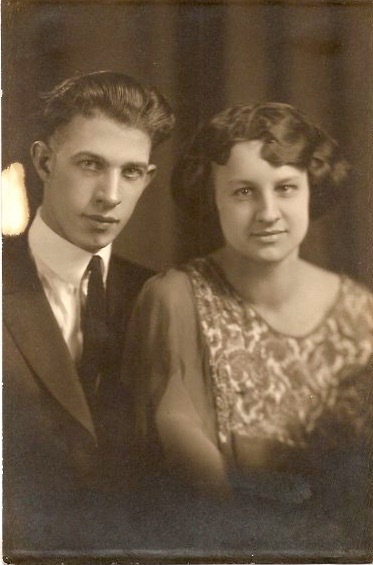 On June 29, 1923, Floyd married Alice Cunz, who was from Leland in Southern DeKalb County. Shortly after they were married, they had a portrait taken (show in the image on the left). They lived in DeKalb, and had two daughters, Jeanette and Bernice. In August of 1935, Floyd suddenly got ill and caught pneumonia. He passed away within a few days at Glidden Memorial Hospital on August 20, 1935. His death was quite a shock to his friends and family. He was only 35 years old. He is buried at Fairview Cemetery in DeKalb. His brief but brilliant life deeply impacted the lives of those around him. His widow, Alice, went on to work at Wurlitzer Piano Factory in DeKalb to help support her family. Glenn and his family were very close with her, and visited often. My grandmother, Mildred Kaiser, was very close with her two cousins. When my grandmother needed a job, her Aunt Alice got her a job at the Wurlitzer factory. Alice worked at Wurlitzer for a long time. She later remarried in July 1950 to Carl Olson. Alice passed away on December 20, 1978 in DeKalb. Kaiser family photos, original; Kaiser Family papers, privately held by Emily (Drake) Weil, Kingston, Ill.
1920 United States Federal Census, DeKalb County, Illinois, Population Schedule, DeKalb Ward 4, p. 2B, dwelling 44, family 45, Andrew, Jane E., Glen and Floyd A. Kaiser and Edward Burke, image, Ancestry.com (www.ancestry.com/ : accessed 21 Jul 2018); citing NARA microfilm pub. T625_303, image 4. “Two Brothers Operate Shop,” The Daily Chronicle, DeKalb, Ill., 26 Jan 1924, image copy (www.newspapers.com : accessed 5 May 2017), page 44; Newspapers.com World Collection. 1930 United States Federal Census, DeKalb County, Illinois, Population Schedule, DeKalb, p. 3A, dwelling 60, family 67, Floyd, Alice, Jeanette and Bernice Kaiser, image, Ancestry.com (www.ancestry.com/ : accessed 21 Jul 2018); citing FHL microfilm: 2340245. “Floyd Kaiser Dies Today at City Hospital,” The Daily Chronicle, DeKalb, Ill., 20 Aug 1935, image copy (www.newspapers.com : accessed 6 May 2017), page 1; Newspapers.com World Collection. Emily (Drake) Weil, granddaughter of Glenn Kaiser, (Kingston, Illinois), interview by Eva Johnson, August 2018; notes of the interview privately held by interviewer, Kingston, Illinois, 2018. It’s always sad when people die young and leave behind spouses and children. Thanks for sharing Floyd’s story. It is especially hard for the family that remains. I’m glad I had a chance to share Floyd’s story, since he was so close with my great-grandfather. Excellent story! I am participating in #52Ancestors as well. I appreciate the discipline it has given me to record family history and share it with my extended family. Me too! It helps me come up with stories that I might not usually share, and gives me a general deadline, so that I keep on schedule. Thanks! In my family, divorces were not unheard of back then! Coincidentally, they are less common now than they were then! Somehow, it always surprises me as well. At first, when I had such a find during my research, I thought it was a mistake. I found out about this divorce by mistake! I had assumed that her husband had died, so that’s why Jennie got remarried. I was searching through newspapers to try to find a mention of his death, and I found out about the divorce instead. I shouldn’t have assumed that he had died! Unfortunately, I have no idea what happened to Thomas Burke after the divorce. Though sad, this is a very nice profile of the youngest Kaiser brother. Thanks for sharing. Nicely written post! I love to read family stories especially of those who have died young. It keeps them alive in our memories and is a wonderful way to honor them. We hear today about “blended” families with divorce, remarriage, step chikdren, half- siblings etc, not realizing this was a feature of family life more than a century before. But what a family unit with 18 children! A sad story. Floyd was such a handsome young man. How sad he died so young, but how wonderful that you are keeping his memory alive. It’s always a shock when someone young dies of pneumonia. So good that you’ve keep Floyd’s memory alive.